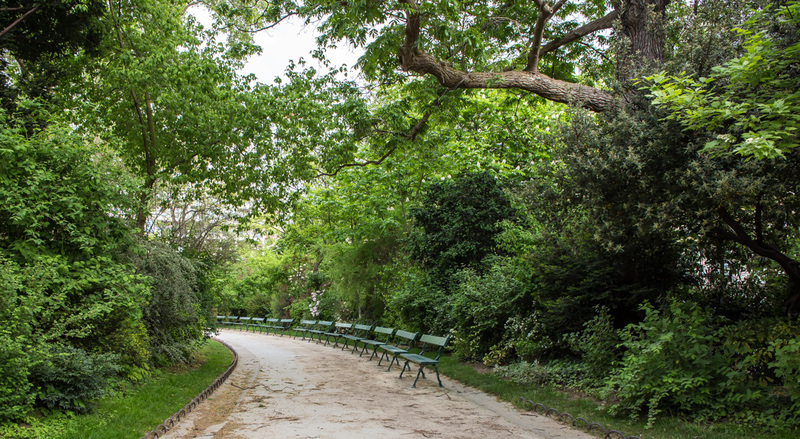 I planned my Saturday morning walk to reach the Square des Batignolles, a nice green park toward the northern end of the neighborhood. Beyond it, according to my twenty-year old plan de Paris (a pocket street map of the city), were rail yards and train maintenance shops. Park benches in the Square des Batignolles. But, once back at home, I was reminded why it's a good idea to get a new map every now and then. I could see on Google Maps that those rail yards are gone, replaced by a new park named for Martin Luther King, Jr., and surrounded by new residential developments. I would like to have seen that, and was very close to it, but I had no idea it was there. 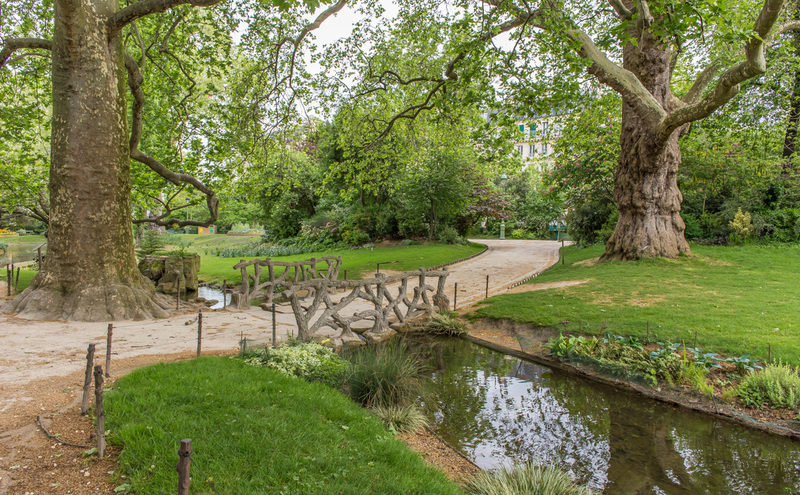 A bridge over the pond in the Square des Batignolles. Another reason to replace the maps is that the Paris transit system (métro and RER) have also been growing. There are new lines, line extensions, and new stations that don't show on the old maps. This was not so much of a problem for me, because as a former transit professional, I'm always looking at what's going on in Paris transit. Besides, all the maps in the stations are up to date. Still, the next time one of us plans to be in Paris, we'll have to get a new map. I have never been to the square des Batignolles; it is my loss because it looks very nice and inviting. Do you not use Google Maps on your phone? Those are some elderly trees! Nor have I been there, chm! I got a new Plan de Paris after spending a frustrating period searching for a Métro station that had been renamed. As for Google Maps on the phone: the paper Plan is so much easier to use, and every single street is labelled, right there on the page. No zooming and scanning required. Another excuse to get back to Paris soon. I regularly go through our guide books and maps and weed out more of the ones that were produced before there was electricity. chm, it is nice, and it's a small park. ck, I don't have a smart phone, so I don't have the option. evelyn, they sure do look it! Walt: Yes, I've noticed that. Big or trendy stuff shows up right away, but the unpaid small places often don't show up at all.